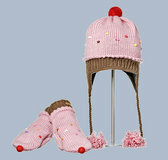 100% Mercerized cotton Sock Monkey Hat is too cute for words. 100% Mercerized cotton Sock Monkey Passport Bag fits all the essentials and is too cute for words. 7 inches wide with zipper closure.